"Chicago has a great infrastructure for new business start-ups and is one of the most desirable markets in the United States," says Omar Duque, President & CEO, Illinois Hispanic Chamber of Commerce. 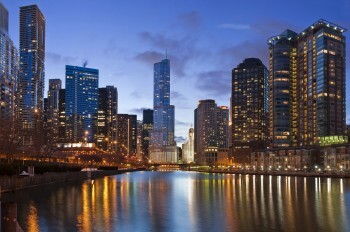 Although it is often known as the “Second City,” Chicago is a first-class town when it comes to diversity. With more than 38,000 Hispanic-owned businesses, Chicago is home to one of the largest Hispanic populations in the United States. Today, Hispanics comprise almost 30 percent of Chicago’s population and about 16 percent of the population in Illinois. “Chicago has always opened its doors to immigrant waves moving here to seek out a better living,” explains Omar Duque, president and CEO of the Illinois Hispanic Chamber of Commerce. “Currently in Illinois, one out of every five school children are of Hispanic descent and one out of every three births are Hispanics.” That means that close to 90 percent of Illinois’s population growth can be attributed to the growth of the Hispanic community. In the last decade, the Hispanic population in the state has grown by close to 33 percent, while the rest of Illinois’s population actually declined by one percent. “This highlights the growing influence of Illinois’s Hispanic population,” Duque adds. Hispanic businesses in Chicago represent some of the most profitable Hispanic firms in the country, and due to the powerful, seemingly ever-expanding Hispanic community, businesses looking to target Hispanics will find themselves particularly successful. “Chicago has a great infrastructure for new business start-ups and is one of the most desirable markets in the US,” Duque says. Chicago’s economy, which thrives on a combination of mature and emerging businesses, is bouncing back thanks to its newer biotech and information-technology industries as well as its emphasis on green energy. In fact, Chicago is now home to 18 wind-power companies and has more buildings registered and certified by the US Green Building Council than any other city in the nation. Chicago’s other major industries include manufacturing, transportation and distribution, and financial services. “Hispanic businesses in Chicago and Illinois remain centered in the service area, but continue to lack access to traditional- and nontraditional-business capital,” Duque says of one of the city’s challenges. “They also tend to lack access to resources and tools that will enable them to achieve the full potential of their enterprise.” But, Duque and his team at the Illinois Hispanic Chamber of Commerce are committed to fixing this by providing business owners with access to resources, as well as training, advocacy, and technical assistance. “Hispanic businesses contribute much to the overall health of the economy in Chicago and we want to ensure that contribution continues and grows,” he adds.